New Gift Shop Sale and Mixbook Coupon! 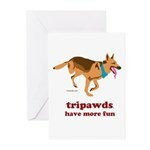 Save 10% on Tripawds Gift Shop orders over $40*, thru 03/24/12 with Cafe Coupon Code SHOPTF1. Browse all three legged dog designs or shop by products and use code SHOPTF1 upon checkout at Cafe Press. 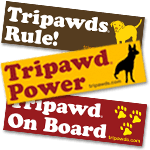 Save on all your favorite three legged dog t-shirts and gifts from sweatshirts and travel mugs, to dog t-shirts and Tripawds greeting cards. Get a Team Tripawds jersey for upcoming K9 Cancer walks, or personalize your own Tripawds t-shirts! *Save 10% off CafePress shop orders of $40 USD or more, excluding shipping charges, gift wrap charges, applicable sales tax and custom duties. All orders must be added to cart from CafePress shops only. Excludes CafePress marketplace purchases (e.g. all products added to cart from URLs beginning with the following (i) shop.cafepress.com, (ii) t-shirts.cafepress.com and/or (iii) cafepress.com/sk/), Gift Certificates, Flip products, SIGG bottles, Thermos products, yoga mats, Dreams products, Fathead products, and CafePress Make and bulk orders. Coupon code SHOPTM2 must be entered at check out. Promotion starts on March 15, 2012 at 12:00 a.m. (PST) and ends on March 24, 2012 at 11:59 p.m. (PST). Offer valid online at CafePress only, cannot be combined with any other coupons or promotions and may change, be modified or cancelled at anytime without notice. This promotion cannot be applied to past orders. Mixbook is offering up to 50% off select custom Photo Books you create through the end of March. 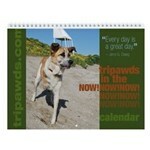 Browse all Tripawds books or create your custom photo book now and save with Mixbook Promo Code ANNUALSALE through o4/01/12. This includes their biggest selling photo books! Mixbook.com is the hottest place to create and share customizable photo books, cards, and calendars, all online, with no download required. Their intuitive online software allows you to quickly and easily create professional looking masterpieces and fully personalize them with thousands of free creative elements. Once the photo project is complete, they print and ship your order. It’s that easy. Save On Team Tripawds Jerseys!